DISCONTINUED SERIES OF PRODUCTS SHOWN FOR ARCHIVE PURPOSES. Tascam's SS-Series are a collection of single rack space solid state recorders for the installation market. Designed for applications that have previously relied on a cassette or Minidisk (MD) recorder, the robust SS-Series record to CompactFlash cards in CD-quality WAV or in MP3 format to achieve extended recording times. 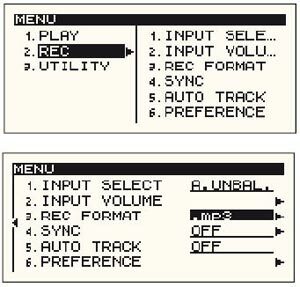 The SS-CDR1 adds a slot-loading CD recorder for direct audio CD creation, direct MP3 recording to CD as well as audio transfer functions between CD and CF. The professional SS-R1 and SS-CDR1 models are both equipped with balanced and unbalanced audio inputs and outputs, SPDIF coaxial digital in and out with sample rate converter, RS-232 serial and parallel control, a wired remote control and a computer keyboard input for folder/file naming and remote control. Also included are traditional features like pitch control and key control, auto cue and auto ready, instant start, fade in/out on playback, auto track increment (level or time based), power-on play and sync recording. The budget SS-R05 model offers many of the same features but with the exception of professional balanced inputs & outputs and RS-232 serial and parallel control. The advanced Solid State Sound technology in the SS-Series provides hours of recording to affordable and secure CompactFlash media, and recordings can be transferred quickly to computers for editing, archiving or publishing on the internet. With fewer moving parts to break down, these products are designed for years of trouble-free use.